Did you ever wonder why your skin doesn’t “glow” like it did when you were younger? When we are young our skin naturally turns cells over quickly resulting in “radiant” skin. unfortunately, this process slows right down as we age. The goal of any skin peel is the removal of the outer layer of dead cells, peeling the skin removes dead skin cells and stimulates up your skin cell growth cycle, it then stimulates collagen and elastin to tighten and firm the healthy layer beneath. Facial peels are carefully formulated to clear away a dull-looking, uneven surface texture. Using gentle acids, a peel lifts away dead skin cells and sheds the surface layers, signals are sent to the living cells bellow to multiply and move up, to increase collagen production, to make more hyaluronic acid. This results is the skin behaving like a younger healthier skin! Another HUGE benefit of a skin peel is that once the surface layer of skin has been removed skin becomes more permeable and this will allow for much better penetration of your skin care products as there are no dead skin cells impeding their penetration. A peel can reveal a fresher, glowing complexion beneath, giving your skin care routine the boost it needs to achieve your best-ever skin! Having skin peels performed fortnightly for a series of six treatments strengthens the outer layer of the skin, improves texture, softness, superficial blemishes and uneven skin tone. Skin peels increase hydration levels of the skin resulting in skin plumping and reducing the appearance of fines lines and wrinkles. Paramedical sounds scary but it actually just means RESULTS! Our paramedical treatments are definitely NOT scary! they are highly specialised, and move treatments from pampering with limited anti-ageing benefits into an exciting new space of highly effective results, performed by skin professionals with advanced training and experience. Our skin peels have little to no discomfort and little to no downtime. Each of our skin peels and our Clear + Brilliant laser would be considered “lunch time” treatments where you can step out of salon and right back into your day! Developed to help you hold onto that youthful glow, Clear + Brilliant is designed to illuminate your natural beauty and refresh your radiance. This treatment uses safe and gentle fractional laser technology to address and prevent the early signs of ageing, it is more effective than chemical skin peels and microdermabrasion, whilst being less invasive than other solutions such as Fraxel, a stronger laser treatment. This revolutionary laser treatment will take your skin care program to the next level by improving tone, texture and pore appearance. Clinically proven to fight and prevent the effects of aging, this treatment refreshes the skin from the inside out and encourages a boost in collagen production under the skin to improve unwanted signs of ageing and giving you the power to prevent pre-mature ageing. The A-Zyme Peel is compatible with most skin types, however, it is not suitable for women who are pregnant or lactating. If you are on any medications or have been using Retin A, be sure to discuss this at your skin consultation. Lactic Acid Peels deliver fast results and actively work to resurface and improve your skin’s moisture levels while restoring clarity and skin luminosity. This type of treatment has a minimal physical peeling effect but this doesn’t mean it’s not working hard for you. Rather than producing a lot of physical peeling, Mandelic Acid encourages the skin’s own regenerative functions. It is suitable for use on most skin types, and is safe for women during pregnancy. The Ultra Brightening Accelerator Mask, targets hyperpigmentation and photoaging concerns. This Mask contains a powerful blend of 8 skin brightening agents including Artocarpus Extract, Pterostilbene and a combination of Alpine plant extracts. The ingredients within this treatment mask assist to break down melanin within the melanocyte resulting in the acceleration in the removal of hyperpigment. In combination with the Ultra Brightening homecare regimen these treatments will assist in brightening the complexion. 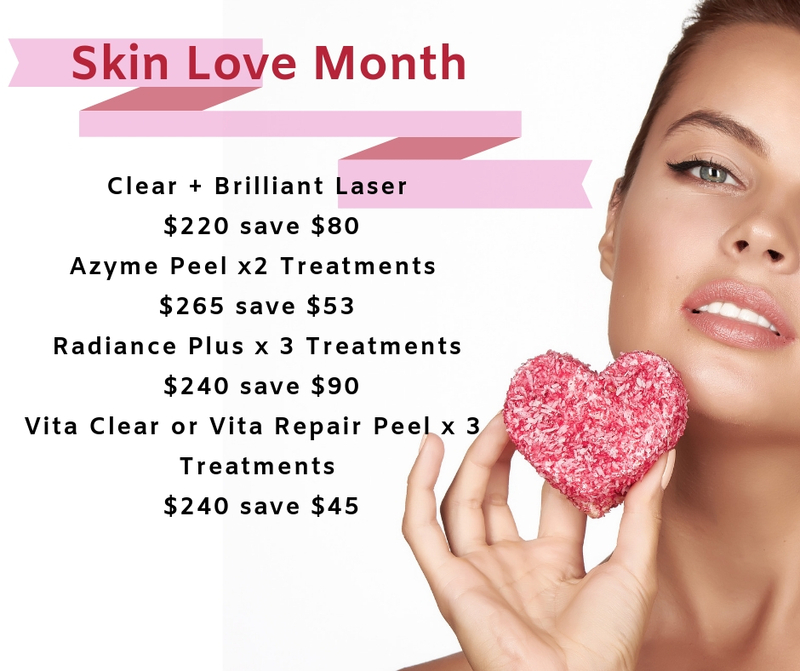 April is Skin Love Month!